Design matters. Readers of this design-lovers' bible don't need to be told that good design makes a difference to our quality of life. But the design that the public notices is the stuff that sits above the radar - designers generally don't have to run around proving that what they do works when it's a well-designed and beautiful bar, restaurant, chair or mobile phone, because it demonstrates its value in happy end-users, which means profit. That profit imperative leads to a people-centric approach from both client and designer. But we need good, people-centric design in every aspect of our lives. And it's often absent where we need it most. For decades, the people commissioning our schools and healthcare buildings, in particular, paid little attention to how the end-user experiences these environments; it was all about maximising efficiencies from a staffing or logistics point of view. We are still slowly unpicking the legacy of 20th-century hospitals, designed as efficient, clinical machines for processing the sick and needy, modelled around the requirements of clinicians and inspired by the prevailing viewpoint that drugs, diagnostics and surgical techniques would unite to vanquish disease. What we have ended up with is healthcare buildings that often alienate and confuse people at a point when they are least able to cope with frustration. Unsurprisingly, aggressive behaviour in Accident & Emergency departments - the area with the highest density of hurt and frightened people - has risen to a point where one in 10 NHS employees experiences violence at the hands of patients or their relatives every year. What's more, the experience and fear of this threat is costing an estimated £69m a year due to high staff turnover, absenteeism and the need to employ security guards. But, thanks to the Design Council, we now have hard evidence of the kind that civil servants love (with clear, quantifiable economic benefits) that one of the most elegantly simple design solutions can make a significant contribution to those on the frontline of public health. 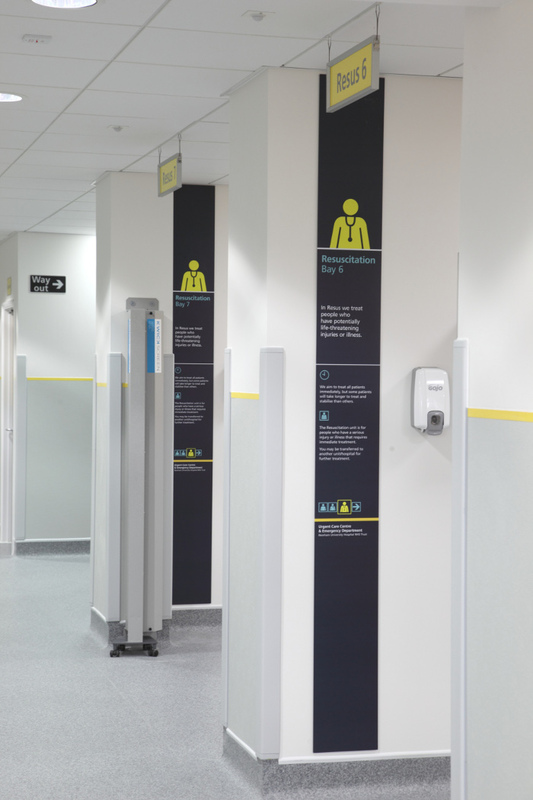 Three years ago British designers Tom Lloyd and Luke Pearson of PearsonLloyd were commissioned by the Design Council to tackle A&E behaviour problems in a pioneering project called A Better A&E. Through necessity the solution had to be cheap, easy to implement and effective. They honed in on the crux of the matter: that people were often utterly confused by the process - above all, why they had to wait so long. Thanks to PearsonLloyd's multidisciplinary project team of designers, clinicians and organisational psychologists, they also identified that a 'battle stations' approach from staff didn't always generate the best atmosphere for staff/patient interactions. So their solution is two pronged. 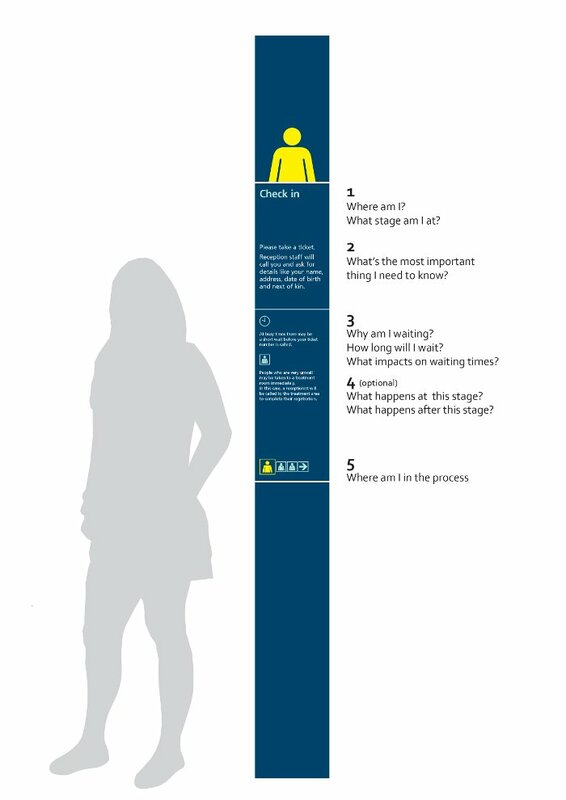 The Guidance Solution provides a bold, clearly legible layering of information to clarify the patient's journey at key points, through signage, graphics, leaflets and digital platforms, so that patients know what to expect. Secondly, the People Solution provides ongoing support - opportunities for reflection and coaching - to old and new frontline staff to ensure they better understand and deal with the causes and outcomes of frustration. There are now four Better A&E schemes completed, with three more in the pipeline. But the Design Council's masterstroke was to commission a thorough and scientific investigation into the resulting behaviours, from Frontier Economics and ESRO, contrasted with two control hospitals where no such intervention had been made. Their findings make heartening reading for any design evangelist: for each hospital's £80,000 intervention, there was a 50 per cent reduction in threatening body language and aggressive behaviour; 88 per cent of patients felt the Guidance project made the A&E process clearer and 75 per cent of patients felt that the improved signage reduced their frustration. Furthermore, hard data shows that, for every pound spent on these design solutions, £3 was generated in cost benefits (thanks to reductions in absenteeism and improved staff retention, among other things). If Lloyd is delighted with his team's success, he is also glad that this data highlights the good work the Design Council has been doing for years. He says: 'The Design Council has always been looking for formats to express the power of design.' Design, that is, as something far more vital and integral to our lives than the mere wallpaper in a bar or the styling of a chair. This project - backed up by hard data - may finally have nailed it.